One of the things that strikes a person who comes in a contact with American people is a fake, disingenuous, completely reflectory smile. In most cultures to smile is defined in the dictionary as “to assume a facial expression indicating pleasure, favor, or amusement, but sometimes derision or scorn, characterized by an upturning of the corners of the mouth“. When I was growing up©, there was a saying: “smile without a reason is a sign of idiocy”. In America a smile is a reflex – “a mechanical response to a particular situation, involving no conscious decision“. It takes some time to catch on to the mechanical nature of American smiles and stop spinning around to see what’s so funny. Nothing is. In America a smile means “my parents paid for this and I had to wear enough metal in my mouth to build a Vespa so, by golly, I am showing these every time I have a chance”. Nothing causes an American to clench his/hers teeth like a photo camera. From the day they are born, Americans are tickled, distracted, cajoled and otherwise harassed into smiling, leaving behind a perfectly smiley record of a happy bliss for no particular reason. No sane person smiles that much in real life and yet you’d be hard-pressed to find a non-smiling photo in many family photo albums. I personally know people who go through destroying and deleting every photo where they don’t smile. 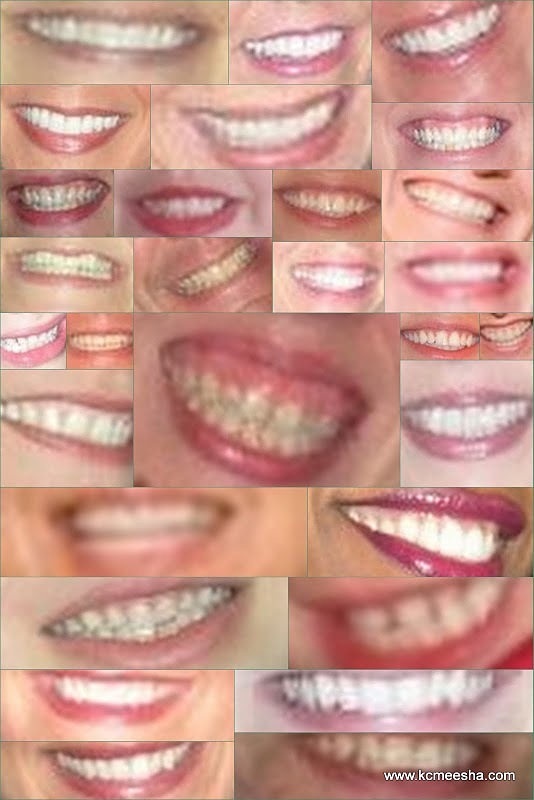 Look through this collage I made using random photos of people I don’t know I found on Facebook. These are not natural smiles, these are either a walking commercials for orthodontics or a gorilla threatening displays called tense-mouth face (the gums and teeth are displayed having the lips curled back). In a recent conversation with a professional photographer (whose name shall remain a secret for his protection) he revealed that many times he practically has to ask people to stop smiling to get their closer-to-real-life image. Just like a salivating Pavlov’s Dog Americans are asked to say “cheese” so many times throughout their lives that a sight of a camera causes their teeth to clench automatically, displaying the proud work of a local dentist and several vacations their parents skipped in order to pay for the photogenic smile. Even the President is not immune to the robo-smile; notice that on the photos the foreigners are not particularly elated or maybe saying “cheese” is below their dignity. Maybe I am bitter from having to go through the medieval torture that was the dentistry of my childhood, but to me an authentic smile for a reason (especially if I am the reason) is much more precious than all the dental perfection displays in the world. Next time you see a camera, your teeth start to clench and your lips just about to curl, don’t say “cheese”, just smile if you feel like it or don’t if you don’t and you will look lovely or handsome. I promise.